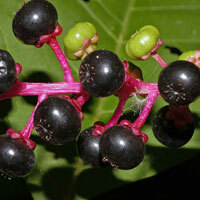 American Pokeweed (Phytolacca americana) is a plant with a wonderful story and history. It is the plant made famous in the 1968 song by Tony Joe White called "Poke Salad Annie", though you really need to go to youtube and see Elvis Presley's Poke Salad Annie. Warning: all parts, mainly the roots; shoots, leaves, and berries can be poisonous. Caution should be taken when using it as food. Pokeweed has been noted as edible when very young in the spring and has been a staple in the diets of poor southern populations throughout America. Many people ate it during the depression to keep from starving, though it is poisonous when it starts to mature and the berries and roots are also poison. The seeds are used to make red dye for naturally coloring wool and hemp fiber and have also been used for ink. The plant can get quite large. It provides food for birds like the cardinal and mockingbird. The town of Blanchard, Louisiana has held a festival in this plants honor for over 40 years. 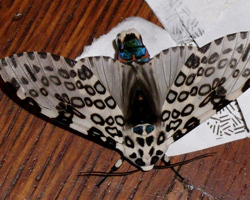 It is the larval food of the beautiful Giant Leopard Moth which has up to a 4" wing span.